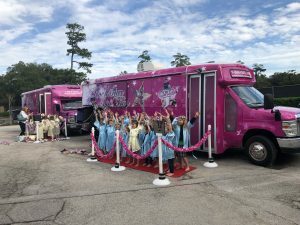 Where can you the best princess parties Houston TX has to offer? It won’t be in a castle, unfortunately, and it probably won’t be at your local club. Children often have limited options when it comes to their parties. Some are held at restaurants or theme parks and that’s nice. Others are thrown in the backyard and really leave a lot to the imagination. However, we aren’t saying that any of these options are bad. Nothing close! We just want to show you that our venues are far better at creating the perfect royal environment for your little princess. Rockstar Spa Bus is the perfect mobile venue that holds all the amenities and fancy extras to make your princess party the best in town. We dedicate a lot to making these parties one of a kind and throughout this article, we’ll go through all of the little details that make our parties amazing. This exceptional experience is a premier offering you won’t find elsewhere so hurry and set your party up now! Our Party Packages Will Astonish You! Rockstar designs each of our packages with a certain theme in mind. Whether that be an all girls party, a mother and daughter day or a mixed up jamboree, we’ve got it covered. The little details that make our mobile spa come to life will be up front and center. You’ll find the laser light shows enticing, and the red carpet we roll out will magnetize you. Everything from the bright pink walls to the zebra print couches is meant to excite and scintillate. The vanity mirrors and the TVs are simply there to make your fun last even longer. All of our packages will give varying degrees of the spa treatments but we will go over them all. From getting a mini manicures pedicures to the botanical hand massages and rose petal scrubs. We have mint sea salt soaks to offer, and the mango massages are to die for! Some of our packages will give you spa robes and even icy cucumber facials. Its all about what kind of experience you’re looking for. With these packages, we can bring something special to any event. It’s no doubt that parents leave busy lives. To support themselves and their families, the demands are high. Each of the parents could be working full time to bring food to the table. That is as honorable as it gets! We know how hard it can be to find the time just to spend with your child. Yet, to prepare and plan a party, organize it and then host it, too? That’s a challenge that might not be the easiest to achieve. Especially under all of the pressure, you’re going through. Of course, for your child, there is nothing too hard or out of reach. However, we don’t want you to work that hard. Rockstar wants to be able to bring your little girl the best party experience without all of the efforts from your end. This way you can spend less time preparing and stressing over all the little details and who will be invited or how much food to bring. Instead, you can focus on enjoying the special day with your special girl. She means the world to you, and we don’t want you to be too tired or distracted to cherish her! If you schedule a party with Rockstar we will make sure that the only things you’ve got to do are keep your children clean and get ready to kick back and enjoy the experience. This way, the king and queen can be a part of her princess party, too. Before the party, we will need to know a little information about your children. This includes any allergies or requests. After we have been scheduled, just remember there is a 72-hour cancellation window. Otherwise, we’re ready to go! Each of our packages will last for 1 hour and 45 minutes. On the day of the birthday party, our driver will take the bus directly to your location. When they arrive, they will prep the bus and get ready for the party. Once it begins you don’t have to worry because we’ve got it all sorted. The party will take flight and we will orchestrate the grand princess experience. All you’ve got to do is just enjoy yourself and your daughter will be having the time of her life! It’s that simple. Of course, if there are any issues with getting to your location we will be happy to refund you or reschedule. There are also additional fees set aside for any extra guests that exceed the limit for the package you selected. Nevertheless, it should be quite simple and smooth from start to finish. Contact Us Now For Your Next Princess Party! Our mobile spa bus is a revolutionary take on a traditional luxury. Spas are not cheap, but with Rockstar you can get an excellent array of treatments for a fraction of the price. What’s even better is it will be for multiple people, so your daughter can enjoy this lavish time with all of her friends. We are so excited to bring a Houston princess party to your daughter, it will empower her and refresh her for the next year. Our goal is to build self-confidence and esteem whilst still having a great party. The goal is to instill a healthy sense of hygiene and self-care in your child so she can grow with the right principles in mind. If you’re looking to set up a party with us, give us a call! Our phone number is 1-844-GIRL-SPA (4475-772) or you can simply contact us on our website. Rockstar looks forward to hosting your next party, and we’ll make sure it’ll be one the princess will never forget! The 2017 Houston Livestock Show and Rodeo’s attendance set a record at 2,611,176. Isn’t that incredible? The Bar-b-que contest alone drew 226,369. More than 40 million passengers pass through Houston’s George Bush International Airport’s gates annually making it the 28th busiest airport in the world. United Airlines alone has more than 800 daily departures. Buffalo Bayou, the slow-moving principal river of Houston, stretches 53 miles and the has several large tributaries including White Oak Bayou, Greens Bayou, and Brays Bayou.